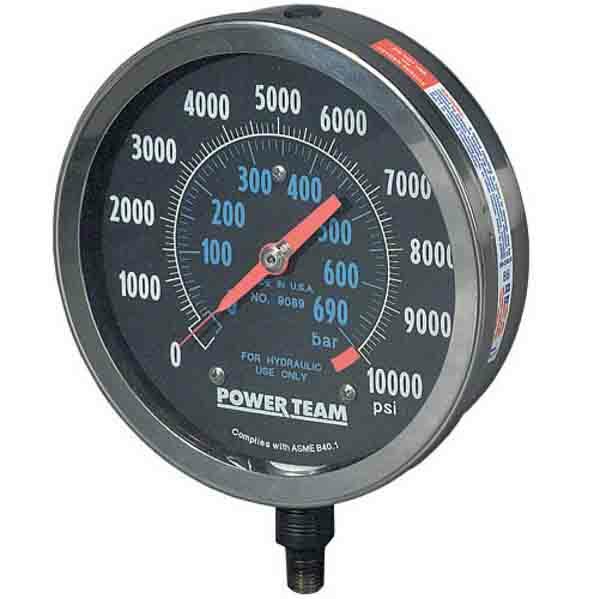 For use with Power Team hydraulic cylinders and available with both PSI and Bar graduations.These gauges feature an easily readable and highly visible, red day-glo needle and high strength steel bourdon tube to ensure high cycle life. Complete with stainless steel cases and lens locking rings. All these units are fitted with a 1/4" NPT connections. † The tonnage scale on the gauge is based on a different effective area. A slight error in tonnage reading will occur relative to the different effective area. At SGS we’ve got an amazing selection of hydraulic pressure gauges for you to choose from. Whether you’re looking for a digital pressure gauge, silicon gauge fluid or gauge fittings, our collection of air pressure gauge accessories and pressure indicators is sure to supply all of your hydraulic pressure gauge needs. Browse our selection and purchase your next pressure gauge or pressure gauge fittings and accessories with us. From ton and bar hydraulic pressure gauges to pulsation dampeners and digital pressure gauge auxiliary power cords, our digital pressure gauge collection is for use with Power Team hydraulic cylinders and available with both PSI and Bar graduations. These digital pressure gauges are accurate and top quality, featuring an easily readable and highly visible, red day-glo needle and high strength steel bourdon tube to ensure high cycle life. Complete with stainless steel cases and lens locking rings. All these units are fitted with a 1/4" NPT connections to ensure only the best quality. At SGS we pride ourselves on our exceptional customer service, so if there’s any information that you need on anything from digital hydraulic pressure gauges to our pressure gauge fittings, then please don’t hesitate to get in contact. Our friendly and highly knowledgeable customer service team is more than happy to help with any question that you might have, so make sure you give us a call on 01332 576 850. When you spend over £50 with us, you’re eligible for free delivery too. So don’t delay, order your pressure gauge fittings and digital pressure gauges with SGS today and have the goods you need in no time.